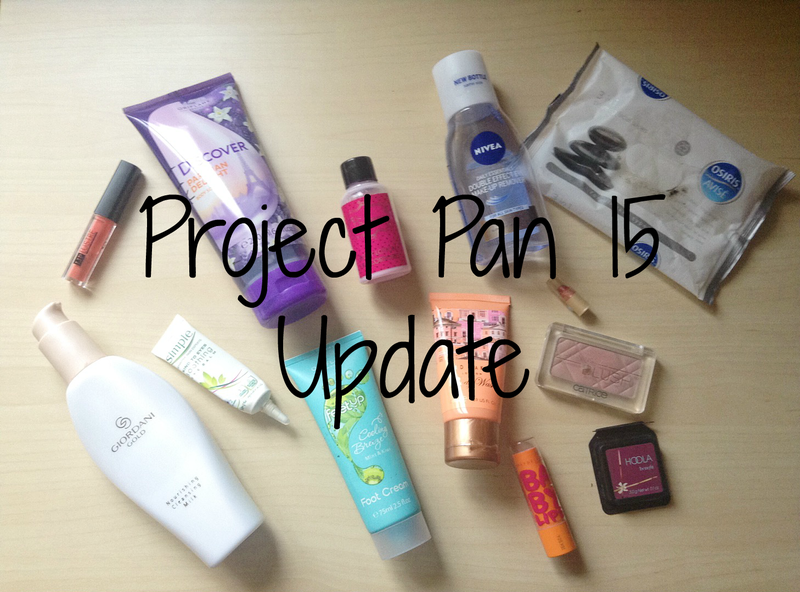 I can't believe it has been a month since I started my first Project Pan, click HERE, I thought I would give you a little update on how I'm getting on with the products. I have been using this twice a day in the morning and at night to cleanse my face after removing my makeup. I thought I would be using this up quicker but that is obviously not the case. I have a feeling I mightn't get this finished by the end of this project. I love using this as it makes my feet feel silky and smell amazing. I have been using this twice a week before I go to bed. I don't think I'll get it finished but I hope I'll use up half of it. I am so happy with the progress of this. I have been using this twice a week on my arms as they get quite dry. I don't mind it but it is a thin moisturiser so I put on a bit more than I usually would with other body lotions. I have been using this every time I hop into the shower. I like the smell but a little bit goes a long way. I am happy with how much I have used but I would like to get it finished by the end of this project. I have been using this to remove my makeup and I found that I went through it really quickly. I definitely should have this used up by the end of this project. I'm not exactly sure how much I have used of this as it is really hard to see how much is left, each time I look at it, it looks completely different. I have been using this to exfoliate my legs before shaving but I think I might start using it on my arms as I have a few dry patches that it might help. There are very few face wipes left, maybe 3. I have been using these to spot clean my brushes especially my foundation brush and eye shadow brushes between washes, remove swatches on my hands or clean my desk before taking photos. I am really surprised how much I have used of these and I hope it will continue. I thought this would be the first one to go but I keep forgetting to use it at night. I have noticed that there isn't as much coming out of the tube so hopefully I will have it used up soon. I feel like I didn't use this very much, I found no visible difference from the line I started with. Hopefully now with school I will use it more as it gives your lips a nice sheer tint of colour. I didn't wear this lipstick very much as I don't see it as a Summer shade but with Autumn coming I think I will get more use out of it. I haven't been using this very much either but I hope that I will wear it more now school is back as it's a natural lip colour with a bit of sheer colour. I have been using this whenever I wear makeup to contour and bronze my face. I accidentally dropped it and a chunk of the product is now gone. The middle of the powder is very thin so there will be more pan in the next update. I might need to repress it when that happens as it'll be hard to get the product out of the corners. I have been using this every day and I feel it doesn't look like there has been any progress. The embellishment in the middle has faded a little. I am trying to find over ways to use it other than blush as it makes hitting pan seem nearly impossible. I finished this in the first 2 weeks and I am so glad I have it out of my collection so I can work on the rest of my cheap body sprays. I have no idea where this went. I may have left it up in Dublin, I'm not too sure. So that means it's gone, there wasn't much left in it anyway. That's my 1 month update on my Project Pan 15. Are you doing a Project Pan? How is it going? Thanks for commenting Kate! I have never read another Project Pan post as I know they are mostly on YouTube. Thanks for commenting Laura! I hope I get most of these products finished in the next few weeks before the finale. I love the feeling of finishing a product. I've never heard of 'Project Pan' until now! I think that's just how I am naturally, I have always been one to use up my products before I buy new ones! Thanks for commenting Em! I don't use up products I don't like and they end of piling up.